Not very strong but distinctly copyable here in Colorado. There was no transmission on 5290 AM at 1430, which is sometimes broadcast on the 5th of the month. (Double checked that one against the "soy sauce" kiwi SDR in Chiba, Japan.) Numbers followed K-pop song, and were read until 1512z, then QRT. Repeat of transmission on same frequency today, 07 DEC. Very weak in Denver. Surprisingly weak at Chiba, Japan kiwi SDR (the one called "Soy Sauce"), so the skip zone must have been significant. Good copy on Point Reyes kiwi SDR. Repeat of broadcast on 09 DEC, decent copy above the noise and beating out QRM from adjacent ute signal just above the broadcast frequency. Not only just above, but actually on that freq. 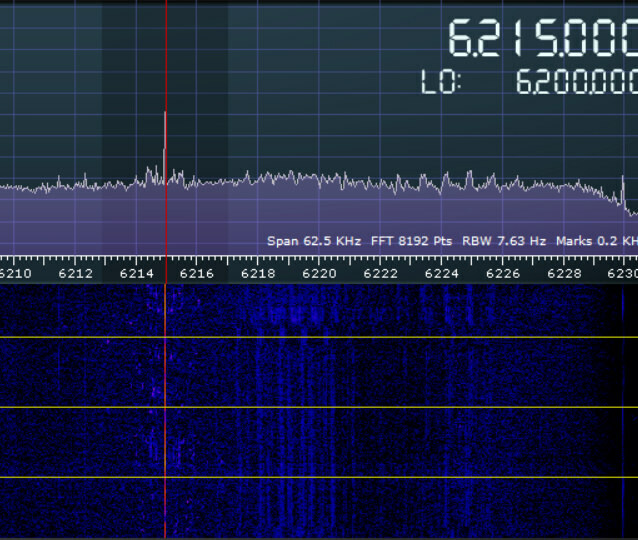 6215 kHz USB is an often used maritime freq. Someplace I have a recording of USCG Station Kodiak telling V24 to vacate the frequency, as this frequency is monitored for maritime emergency traffic, or some similar statements. If there was any overlap today, it wasn't noticeable at my QTH. But looking at it more closely, I think it was actually some of the local QRN I have to put up with. I was so zoomed in that I didn't recognize it at first. Also received in Denver, signal was SIO 132 (weak but free of noise and interference, making for a decent copy). Stronger signal today compared to the 19th, SIO 222 (local QRN in the lower side band making it poorer than it could be). QRT 1508z.